I should have scrapped this special photo ages ago!!!! When I saw Challenge # 73 - "I remember" over at ScrapFIT I immediately thought of this photo of me, my Mom and grandparents taken in 2001. Poppy passed away in 2002, and I miss him every day. My sweet Gran who is 82 has really not been well the last year or so, and it breaks my heart. They both did so so much for us as kids growing up. My Mom was a single parent, and they picked up a lot of the slack. Poppy taught me how to drive, and he gave me away at my wedding. They were/are very special grandparents, and I hope to be able to be as great a grandparent to my own grandkids one day!!! I also signed up for my first class, it's called Trendspotting, and is being hosted by Lisa Truesdell and Kelly Noel over at Studio Calico. I must say I totally love both of these ladies styles of scrapping so I was super excited when I saw they were hosting a class together. I used a few techniques that are going to be taught in this class. With the class you get a bunch of gorgeous cut files, the banner and triangles are both from the class!! Great layout! Love the arrows, colors, misting, everything here is perfect! Love the design of your page!! Lots of great colors together and a beautiful focus on the photo for your story!! When I read it, it sounds so similar to mine!! My parents got divorced, when I was in High School...but my grandparents practically raised me!! My grandfather also taught me to drive and gave me away at my wedding. He passed away in 2010 and my grandmother is in her mid 80's now. That's why I love this hobby and being able to share our stories!! Thanks for playing along with Workout #73 @ ScrapFIT!! Love your page! This is really a sweet layout ... I love how you've done the journalling strips to tell your story ... plus I'm a huge fan of all of the stitching! Thanks so much for sharing with us at ScrapFit! Beautiful layout. 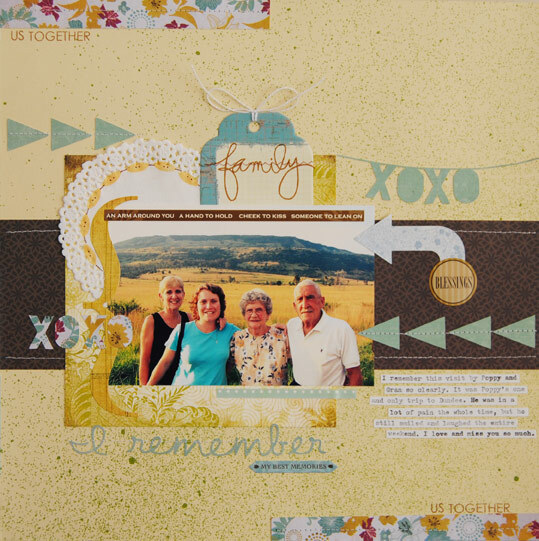 Love the xoxo die cuts and the journalling strips. Wonderful layout! I love the your journaling, its about getting those memories and thoughts down to refer back to in years to come! Thanks for Working out with us at ScrapFIT! Beautiful layout! 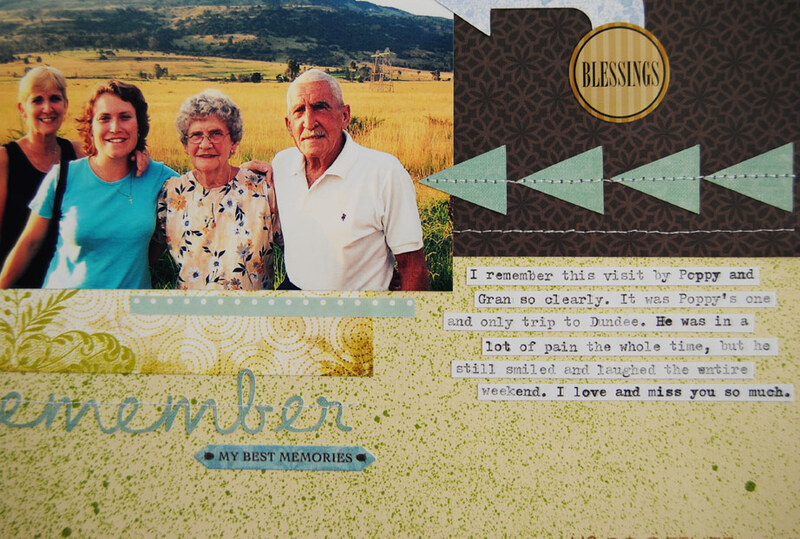 Thank you for sharing your memory with us at ScrapFIT!